Fremont, California, USA, October 25, 2010 - Patriot Memory, a global pioneer in high-performance memory, NAND flash and computer technology, today announced the immediate availability of the Torqx TRB series of solid-state-drives (SSDs). The Torqx TRB series of SSD offer improved system responsiveness with quicker boot times and shorter application loading times over traditional hard disk drive storage solutions. Patriot’s Torqx TRB series, available in 32GB and 64GB capacities, is designed around the latest generation controller from JMicron: JMF616. With a controller level cache of 64MB DDR2, the Torqx TRB series provide stutter-free performance and offer speeds of up to 260MB/s Read and up to 115MB/s Write. To maintain performance integrity over the life of the drive, the Torqx TRB series SSDs include native support for the TRIM command in Microsoft Windows® 7. The Torqx TRB family of SSDs are durable and reliable, with an aluminum housing to minimize typical wear and tear. With NAND memory at their core, there are no moving parts to fail, or be damaged from daily use in portable computing solutions and system boot times are drastically reduced. Additionally, the Torqx TRB family of SSDs provide incredible performance, silent low-power operation and a 3-year warranty. 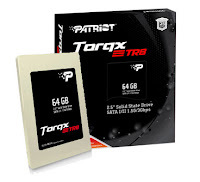 For more information on the Patriot Torqx TRB series of SSDs please visit the product page here.